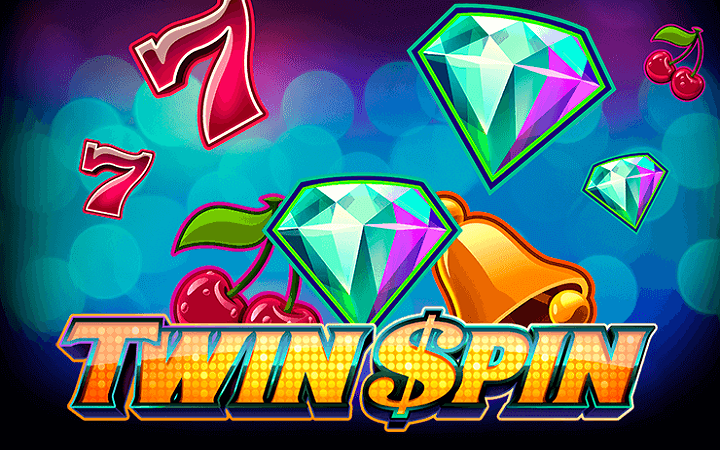 Twin Spin casino slot game by NetEnt online slots is an interesting one: it looks like a classic (fruit) slot but has the rules of a modern video slot game. Graphics are very colorful and impressive – there are no 3D effects or mind-blowing animations but the game has a very clean look, which is more than enough for its classification. If you like to play casino slots online which combines classic looks with modern rules, this is your game. Twin Spin has 5 reels, 243 pay lines and a very innovative feature called the “Twin Reel”. Because of the high amount of pay lines, you can win up to 270.000 coins with a single spin. There are ten symbols in the game in total. Five of them are high-valued and consist of pictures of a golden bell, cherries, a diamond, BAR and 7. The rest is in forms of numbers and letters. The payout ranges of the high-valued symbols are between 10 and 1.000 coins – diamond symbol is the most valued one. There is only one special symbol in the game and it is the wild symbol. Wild is shown with a red/yellow “wild” sign and substitutes for all symbols. It hasn’t got a separate payment value, just substitutes. There are no scatter symbols, free spins (and even multipliers) in the game. But there is an interesting and innovative feature called the “Twin Reels”. The feature is always active and significantly raises your winning odds. Each spin starts with identical, adjacent twin reels that are linked together. During the spin, the twin reels can expand to become triplet, quadruplet or even quintuplet reels. In other words, when this feature hits, all of you five reels can be filled with the same symbols. The coin values of the game start from 0.01 and goes up to 0.50 coins. Maximum bet amount is 250 coins and since you are given 10.00 coins in the demo mode, you can literally play for hours easily. Twin Spin online slot game by NetEnt is a game that needs to be experienced and highly recommended, try the free slots no download version and decide for yourself.